Once the weather clears here in VA I hope to get my 'scope out and take some pics I can share with you. Looking forward to seeing the rings open. Now you can, or at least your name can. JAXA has started collecting names to send to an asteroid which will be left on the space rock. You can also opt to have your name on the sample return capsule, or on both. Spacecraft planners are doing this on almost each solar system mission which is smart because it gets the public interested in the mission and allows us to be a part of it. My family's name is on just about every spacecraft that has done this. Here's something we have NEVER seen before - meteors in Saturn's rings!!!! For the first time ever NASA's Cassini spacecraft at Saturn has captured meteors in Saturn's rings - just unreal. Speaking of the ringed planet, I'll have a blog ALERT on the 28th about Saturn's closest approach to Earth for the year. Comet ISON has been producing large amounts of dust even when it was out beyond Jupiter. At one point it was estimated that the comet was shedding 112,000 pounds of dust a MINUTE! I am sure that rate has gone up and will continue to do so as the comet comes ever closer to the Sun. As a result of that shedding and the effect of the Sun on the dust, it is expected that the Earth will pas through this dust in January 2014. Normally this would mean a meteor shower but the dust grains are so small they will not burn up in our atmosphere. Instead they will remain aloft for some time and perhaps produce some high altitude electric blue colored clouds called noctilucent clouds. These are amazing to see - I have never seen one - but hope that Comet ISON will give me my first view ever. Even at 394 MILLION miles from Earth and 386 million miles from the Sun this comet is a thing of beauty. The picture was taken April 10th and the blue hue was added to enhance details. The comet's nucleus, or solid central body, is estimated to be 2 to 3 miles across. Further analysis will be done as time goes on and distance decreases. It is remarkable that the comet already has a coma - the fuzzy area around the nucleus that is 3,100 miles across - a tail that extends for 57,000 miles, and a small jet on the upper right that is on the Sun facing side of the nucleus. This jet is blowing volatiles and dust off of the surface of the nucleus. Comet ISON is currently moving at 47,000 miles per hour and will increase its' speed as it gets closer to the Sun. The show is probably going to continue to improve as the comet gets closer to the Sun and exposed to greater heat. One can only imagine what will happen when this comet passes only 700,000 miles from the Sun! Stay tuned as we countdown to Comet ISON. I will have more on the comet tomorrow. Every day is Earth Day......the planet's climate and geology allow us to live and we should never take that for granted. The second stage ignited right on time and the system delivered a test mass into orbit. 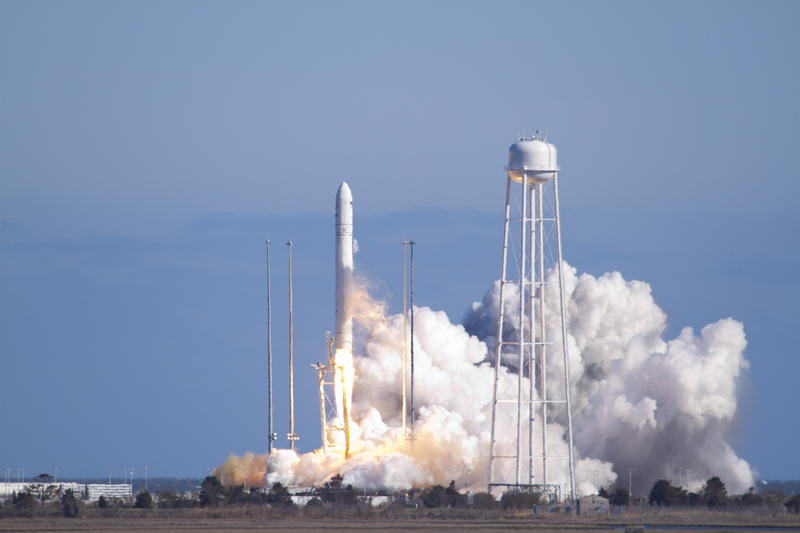 The successful test paves the way for further test flights launched from NASA's Wallops Launch Facility in Virginia and ultimately lead to rendezvous with the International Space Station (ISS). Orbital is the second commercial company to launch a rocket designed to ultimately deliver cargo to ISS. SpaceX was first and has delivered cargo to ISS. These companies mark the eventual return of American hardware delivering cargo and perhaps astronauts to ISS instead of relying on foreign capability. This is a major landmark in America's space program and spurs competition and redundancy in this most critical area. Current theory holds that the Sun and solar system were created when a nearby supernova shockwave began the collapse of our gas and dust nebula. As the proto-solar nebula continued to collapse the Sun eventually began nuclear fusion to become a star and the proto-planets became full fledged planets with asteroids and comets marking the original materials of our solar system. 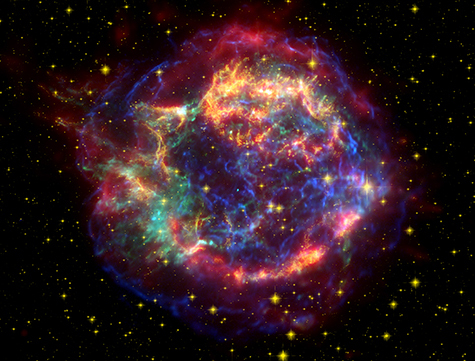 In 2007 NASA’s Spitzer space telescope found the infrared signature of silica (sand) in the supernova remnant Cassiopeia A. The light from this exploding star first reached Earth in the 1600s. The cyan dot just off center is all that remains of the star that exploded. In our studies of meteorites, we have found grains within certain space rocks that were older than the solar system itself. The only way to explain this is to consider that grains of material from other stars must have been part of our original nebula. This makes perfect sense when we see the remnants of supernovas seeding space with the elements created while the star was alive and in its fearsome death throes. 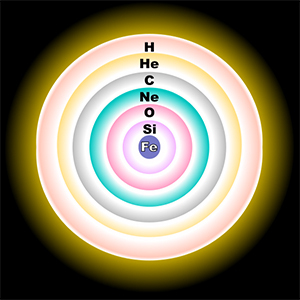 These elements would seed other nebulas with all of the elements that are lighter and heavier than iron. That is why our planet has gold, silver, uranium and titanium for example, because they were made in a supernova explosion, propelled out into space and seeded our nebula. When the Earth formed over a long period of time all of the elements that were in the countless planetesimals (space rocks or asteroids) that collided with our ever growing planet became part of Earth. Current studies of two meteorites have found a grain of silica (the main component of sand) in each that share the same chemical properties. The only way this could happen would be for these grains to have a common source - a nearby supernova event. The presence of silica is of great interest because it is thought to be formed just before a star dies as a supernova. The star tries to survive by burning whatever it can in a runaway fusion process which forms an onion skin layer of elements before the fatal core of iron shuts down fusion and the star collapses and explodes. A massive star that will explode at the end of its life, a core-collapse supernova has a layered structure rather like that of an onion. With the unique chemical properties these silica grains had the scientists were able to model conditions that must have been present in the soon to be supernova star to form them. And for TWO meteorites to have these same unique chemical properties present in each, well, that is pretty amazing. UPDATE: NASA is trying for launch of Antares today, 4-21-13 at 5 p.m. EDT...check the website below and my earlier blog this week on how to tune in and/or see the launch. With recent events we all need a night under a clear sky to enjoy the calm and quiet of the stars. The Lyrid Meteor Shower is a good way to sit back, relax and enjoy some peace and quiet. This is not a major shower like the summer's Perseids or winter's Geminids. The shower can produce 10-12 an hour under ideal conditions but the bright Moon will interfere with this year's showers. It is still worth getting out tonight and watching the sky. NASA's planet hunting spacecraft, Kepler, has found more planets, to include the smallest planets to date to be found in the "habitable zone" (HZ). The HZ is the area of space around a star that the temperatures on the planet should be able to sustain liquid water - a known precursor for life as we know it. At the press conference held yesterday, April 18th, mission scientists discussed the latest finds of Kepler which now pushes its total of discovered exoplanets to 122 with no end in sight. Kepler has identified 2,740 possible exoplanet candidates. In the two new systems rocky planets were found in the HZ, and Kepler 69's star is very similar to our own Sun. It is not known if any of these planets in the HZ can support life. It is only a matter of time until Kepler finds an Earth-like planet in the HZ. Then the speculation about life on another planet can begin in earnest. NASA will hold a live teleconference on the Kepler Mission today, 4-18-13, at 2 P.M. EDT. The exoplanet hunting mission has been a huge success and today's briefing should be an update full of interesting tidbits. UPDATE: The launch was scrubbed due to a premature separation of an umbilical between the Antares rocket and the launch pad. The next launch attempt will occur no earlier than Friday, April 19. Get updates on the launch time and see where you are in relation to Wallpos using the OSC map above. Find a clear horizon and look towards the direction of Wallops right after launch. You can try getting a picture too. On April 4, 2013 I blogged about results from an experiment aboard the ISS that is looking for proof of dark matter. NASA just released today, April 15, 2013 a cool video that tells us more about the experiment, the instrument and the intriguing results. Spring has sprung here in the DC area and tonight promises to be clear and beautiful. For North America and Europe tonight's skies in the west will be a treat as the crescent Moon (complete with Earthshine) will be near Jupiter and some open star clusters. Night by night this weekend, the waxing crescent Moon marches up past stars and bright Jupiter. Illustration is free for use anywhere if you include a link to SkyandTelescope.com. sky. The star of spring, Arcturus, is over in the east and is the brightest star in that region of the sky. Had to share this short but impressive video with you. It shows views of Greenland glaciers taken from VERY low altitude with a camera mounted on a P-3B Orion flown by NASA. I have seen glaciers in Alaska up close and personal but never like this. Its show you how ice is part of a a healthy Earth and shows why we have to study them to monitor the effects of global warming. NASA is involved as part of its Earth studies program. If you like space stuff, you have to take 25-minutes to enjoy this wonderful tour of the ISS given by Suni Williams. She takes us all over the ISS and gives a perspective one can appreciate as she has spent months on the station. This was fun to watch. I hope you enjoy the tour as well. 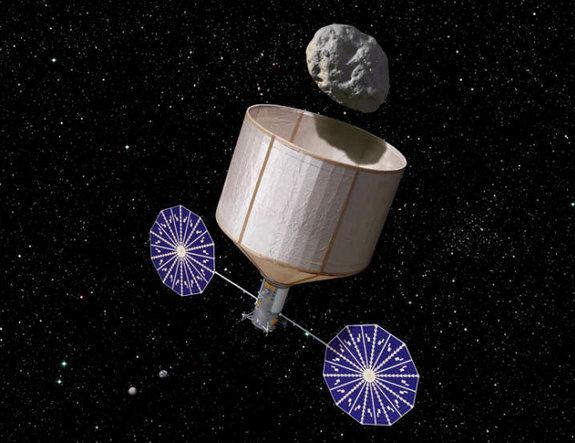 If you read my previous blog and saw the Fox 5 segment, you know that the NASA Budget would be the clue as to whether the asteroid capture and retrieval mission was to be a reality. and the asteroid mission is included so it is a GO! Green Pea Galaxies - yes, that is what they are called - may hold the key to an important era in the development of the Universe. These rare galaxies were found by the public in 2007 during an Internet based citizen scientist project in which the public studies galaxy images to classify them. Well, the Green Peas defied classification and became a major find. The 6 Green Pea Galaxies that were studied are located 1 to 6 billion light years away and may hold clues to the time when the Universe was transforming from being opaque to transparent. Here is a news release that I know you will enjoy. 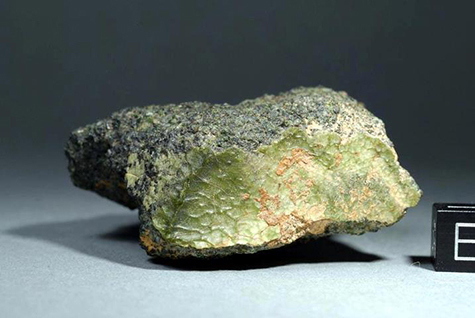 Many of you have been fascinated, as have I, with the green meteorite NWA 7325 - a possible space rock from Mercury. The odd ball space rock was the subject of discussion at the recent 44th Lunar and Planetary Science Conference. 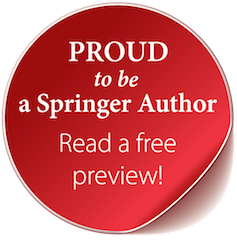 How the meteorite was found, purchased and sent to Washington University at St Louis for preliminary testing, is a great read. As is the scientific discussion about the green space rock. How dark is the sky at your home and/or observing location? Have you ever wondered about light pollution - the dark sky stealing light that is unnecessary and caused by poor lighting fixtures, wasted energy and money? Light pollution can be beat and success has been achieved after efforts were made to do so. Find out what you can do in the fight and make sure you "Celebrate the Night" while doing so. Yesterday results from the $1.5 billion Alpha Magnetic Spectrometer (AMS) located aboard the International Space Station (ISS) were announced. The AMS has been detecting incoming cosmic rays for the past several years before they interact with the Earth's atmosphere. The results, stemming from the analysis of over 25 billion recorded events, detected over 400,000 positrons or anti-matter particles. This was the largest detection ever in space for anti-matter and has significant possibilities in the search for dark matter. The AMS international team of over 600 scientists is hoping that additional research will be able to zero in on the origin of this anti-matter. The prime suspect is that dark matter interactions are creating the detected particles but more work has to be done to totally eliminate the possibility that the particles are coming from pulsars in our galaxy. The team expressed high confidence that in the upcoming months they will be able to eliminate the pulsars as a source and be able to zero in on dark matter as the cause or origin. Doing so will go a long way in furthering our understanding of this unseen and unknown component that makes up 25% of the Universe. 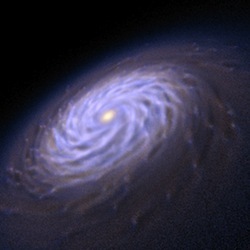 We live in a spiral galaxy called the Milky Way and can see many other spiral galaxies in the Universe. But how they form their spiral arms and how they last has been a significant question. New research which included supercomputing simulations has provided some interesting results and a cool video on YouTube. By the way, the summer constellations that feature views of our galaxy are visible in the hours before dawn. But their true magnificence will have to wait until the hot nights of summer when fireflies keep earthly company with August thunderstorms and the Milky Way sweeping through Sagittarius into the Sumer Triangle.